To get the most of your TC-400, consider adopting these best practices for its installation and use. Driver feedback signs from Radarsign serve as effective traffic calming solutions because they inform drivers of their traveling speed. To encourage correction of speeding, the drivers must also be informed of the local speed limit as a point of reference. To create a traffic calming circuit, install Radarsign Go Brackets on existing poles at multiple locations. This enables personnel to quickly and efficiently relocate the TC-400 to areas in need of traffic calming in a regular rotation. The signs can then be moved with NO TOOLS, just a key is required. Additionally, follow these guidelines to ensure that your TC-400 is properly installed. One set can be charging, ready to replace a depleted set at a moment’s notice. 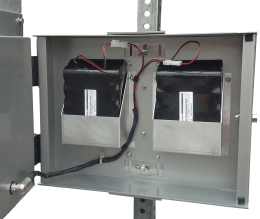 One set of backup batteries can serve multiple Radarsign devices. To get a longer life from you power source, set the feedback device to turn off during overnight hours if traffic in that location is minimal. Also set the minimum display speed at, or slightly below the speed limit of the road. For example, if your street has a speed limit of 30 mph, set the minimum display speed no lower than 25 mph. Setting the speed limit at 10 mph will turn the display on for virtually all traffic, and simply run the battery for people who are not speeding. Be sure to store and charge batteries in a temperature controlled environment. Charging and storing the batteries outside in the cold and hot temperatures will diminish the overall life and performance of the battery packs. A suggested strategy for initial TC-400 deployment would be to operate in stealth mode (feedback display off) for up to one week. Then turn the feedback display on for one week. 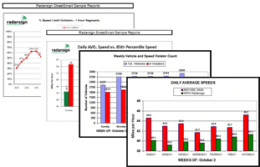 Using the Streetsmart traffic data reporting program, take the data collected from the sign, and compare the information from both weeks. This will give you a baseline of the speeding problem (week one). It will show you the overall effect of the radar sign alert display on the speeds of drivers. It will also show the time of day and day of week that speeding is the worst. You can see how many drivers are more than 5 mph over the speed limit, how many are more than 10 mph over the speed limit, and how many are 15 mph over the speed limit. This information can be used to deploy police resources intelligently. Sometimes law enforcement officers deploy a radar speed sign to a neighborhood based on citizen complaints about speeding. Officials often learn that, despite resident reports, drivers are actually complying with the speed limit. Historically, a citizen’s evaluation of vehicle speed tends to be quite inaccurate. Still, residents are concerned about the safety of their pets and children. To alleviate their fears and build goodwill within the community, share what the StreetSmart data has revealed. This can be done via social media or through a direct person-to-person visit. If the data reveals a speeding problem that needs further action, share that information as well, along with the agency plan for addressing the problem. Whether it be sub-arterial roadways, school zones or neighborhood streets, decide in advance how and where your Radarsign TC-400 will be used. These devices will become quite popular among citizens and business owners so you can expect significant demand for their use. Establish your community guidelines and remain consistent. These tried and true best practices have been proven to support the effectiveness of Radarsign brand radar speed signs.